On Sunday 17 July at 3pm, The Friends of Holy Saviour Church invite you to join them for another “Talk & Tea” event. 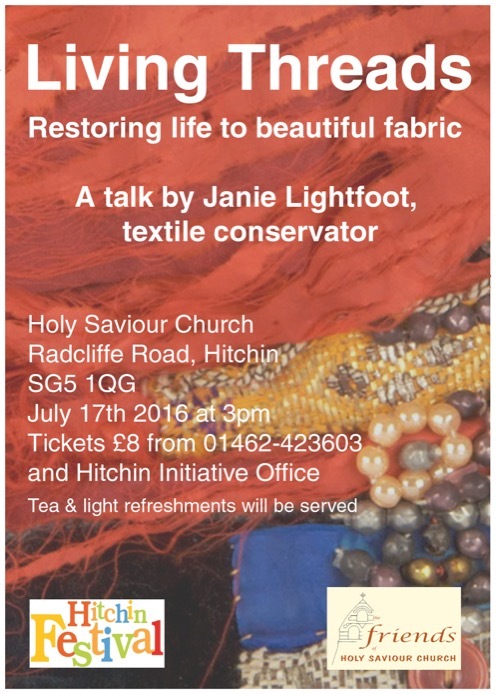 Janie Lightfoot will give an illustrated talk on the work of textile conservation, and the wide range of projects conservators encounter. Her studio – Janie Lightfoot Textiles – carried out the conservation of Holy Saviour Church’s beautiful Alleluiah Altar Frontal last year. Tickets (including tea and light refreshments) £8 (£7 for Friends of HS) available from Gill Chidgey, 01462 646257, or Hitchin Festival Box Office at Town Centre Initiative, Churchyard.